Djokovic is 64-3 2011, winning three of the four grand slams. He has multiple wins over 16 time grand slam champion and former #1 Roger Federer, and has defeated Rafael Nadal all six times they have met this year (all in finals, including Wimbledon and the US Open). Controversy instantly surrounded Nole about his leap to the top of the rankings. Was it really just his new gluten-free diet? Does it also have to do with this pressurized egg (CVAC pod)? Wind the clocks back a few years. The years are 2007-2010. Roger Federer is #1 in the world, nearing the end of his prime. Rafael Nadal and Novak Djokovic, are rising players and are entering their prime years. Nadal rises first, with his epic victory over Federer at Wimbledon in 2008. After Federer displays a trance of magic in the summer of 2009, Nadal has an outstanding season in 2010, winning three of the four slams, a feat only achieved by a handful of players, including Federer (3 times: 2004, 2006, 2007). Throughout this entire time and for as long as most have known, Djokovic kept steady at #3 in the world. He has won one slam to this point (2008 Australian Open). Djokovic became known for retiring from matches due to all sorts of issues (mostly breathing problems and heat issues). General knowledge told you Novak Djokovic has a fitness problem by a physical limitation, almost directly health related. Players spoke about it when asked (Federer, video above; Roddick, video below), and it was simply a known fact on the tour about Nole. Always a gray area when a player retires due to injury or other health reason, but for Djokovic, this was becoming a habit year in and year out. He has retired in each slam except the US Open (Australian Open 2009 to Roddick, Roland Garros 2006 to Nadal, Wimbledon 2007 to Nadal). Even in 2011, as world #1, he has retired twice (Cincinnati final vs Murray; Davis Cup vs Argentina (Juan Martin del Potro). The second of those appears slightly understandable but many would say to stop with Murray just three games from a true victory is unsportsmanlike. Andy Roddick when asked about Novak Djokovic after their match (2008 US Open). Andy Roddick and Novak Djokovic in their press conferences following their match (2009 Australian Open). Djokovic retired due to heat issues. Fast forward to 2010. Djokovic leads Serbia to the Davis Cup title. This fueled his confidence heading into 2011, along the gluten free diet (and that special pressurized egg). WSJ (Wall Street Journal) reports that ever since last year’s U.S. Open, Djokovic has been trying to improve his fitness by climbing into a rare $75,000 egg-shaped, bobsled-sized pressure chamber. Excerpts from the WSJ noting facts and statements from CVAC Systems. The machine, which is made by a California-based company called CVAC Systems and hasn’t been banned by any sports governing bodies, is one of only 20 in the world. Unlike the increasingly trendy $5,000 hyperbaric chambers many professional athletes use to saturate the blood with oxygen and stimulate healing, the CVAC is a considerably more-ambitious contraption. It uses a computer-controlled valve and a vacuum pump to simulate high altitude and compress the muscles at rhythmic intervals. The company claims that spending up to 20 minutes in the pod three times a week can boost athletic performance by improving circulation, boosting oxygen-rich red-blood cells, removing lactic acid and possibly even stimulating mitochondrial biogenesis and stem-cell production. Djokovic is so convinced that the pod helps his game that during the U.S. Open, which starts Monday, he’s staying (for the fourth year) with a wealthy tennis-trainer friend in Alpine, N.J. who keeps one of the machines on his property. Merely conversation, but does this explain a bit of the visible shock many noticed in the physical battles with Rafael Nadal this year? Avoiding other topics, Nadal, known for being one of the most, if not the most physical player on tour, was visibly exhausted in the third sets of their encounters earlier this year (finals of Indian Wells, Miami). Hands on knees, shirt soaked in sweat and heavy breathing; that was Nadal. Djokovic? Walking around almost as if he just played a routine point. 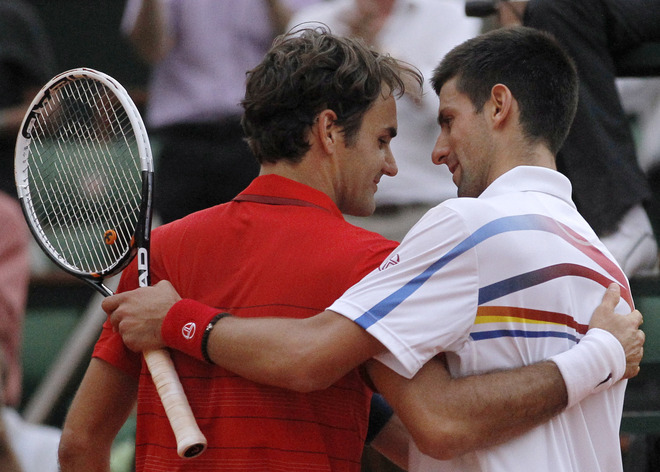 This pattern continued in each of their following meetings, as it was Nole who prevailed in most of the longer rallies. Talk about turning of the table to the past where Rafa won the majority of those kinds of points. How does WADA (World Anti-Doping Agency) feel about this? In my opinion, not aggressive enough. In 2006 the World Anti-Doping Agency ruled that such oxygen tents enhance performance and violate “the spirit of sport,” but did not add them to the list of banned substances and methods, saying they would wait until further studies were conducted. In conclusion, is the egg an unfair advantage? Is it cheating? Why is Novak Djokovic rather quiet to talk about it? Is this finding damaging to the image and reputation of tennis? And how does it make the new world #1 look in terms of spirit of sport? These are only some of the questions which should be posed to tennis fans, journalists, bloggers, and members of the press. Stay connected with FedererFan07 on Twitter and Facebook.